As we all know, music comes in various styles, rhythms, genres and AGES! Today, we’d like to shine the “Spotlight” on Zach Ludlam. One word simply describes this young man, REMARKABLE. With a heart for God and the gift of song, this kid will definitely go far in life. 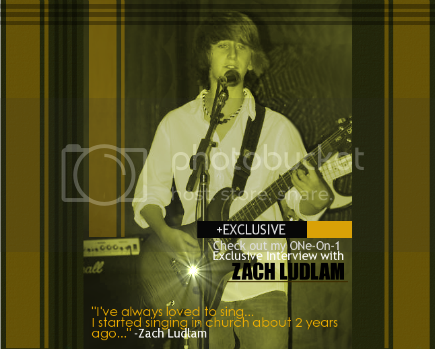 I recently had the honor of chatting with Zach, read on to find out more about him. Hi Zach! It’s so nice to be able to talk with you! I’ve been watching your videos on Youtube for a while now, and I think you are a very blessed, and very talented young man. Thank You...I appreciate the compliment. So Zach, how long have you been singing? I’ve always loved to sing. I started singing in church about two years ago. Is singing what you want to do with your life, or do you have other ambitions as well? If that were to work out It would be a blessing. I’m not really sure what else I would want to do with my life, but there are a lot of things that I am interested in. That’s cool, It’s always good to have other options. What is your favorite genre of music? Contemporary Christian like Mercy Me and Casting Crowns, and I also really like classic rock, like Journey. Awesome! I actually listen to everyone you mentioned lol. So, being that you’re so young and you’re just breaking into the music field, do you get nervous before going on stage? Depends on where I am singing and if I know the majority of those people...I get more nervous if I know most of them. You can’t tell that you’re nervous by watching your videos, you carry yourself like a professional. I see that you play guitar, do you play any other instruments as well? Yes ma'am, I play drums, some piano, bass guitar and most percussion instruments. I am in the band at my middle school and a member of a high school competition drum line. Wow, you’re in middle school and you play in a High School drum line? That’s awesome! So Zach, one of my favorite videos of yours, is you singing Your Grace Amazes Me which is obviously a Christian song. What role does Christianity play in your life? How important is God to you and your dreams? Christianity plays a major role in my life. I am really involved with my youth group at my church. I really enjoy being able to help with our outreach ministry. We prepare meals and go out into needy areas and feed people and their families. God is very important to me. God is the number one priority in my life. That’s a beautiful answer, and It’s great that you value the importance of getting involved at such a young age. You’re family has obviously instilled some very important values in you, speaking of that, is your family supportive of your singing? Absolutely. They are VERY supportive of me. Without my family's support I would not have had nearly the experiences that I have had. That’s great! A supportive family really does make all the difference. Now, I’m sure that music and school take up a lot of your time, but what do you like to do when you’re not performing? I love to go to the lake. I really enjoy Skiing, Kneeboarding and Tubing with my sister. I also love riding dirt bikes. I just have a couple more questions for you Zach and we‘ll wrap this up. So, as far as your life and music goes, who are some of your biggest influences? My Dad. He is very talented and is the biggest musical influence in my life. Awesome! So for the final question, what has been your biggest moment thus far? I actually went to Atlanta and auditioned for Americas Got Talent. I didn’t make it, but it was a really neat experience and I met some really interesting and nice people. Thank you so much for chatting with me Zach! You’ve got great things ahead of you , and please be sure to keep me updated on your music career! You guys be sure to subscribe to Zach’s Youtube channel, and friend him on Myspace! Just click the links below! Check out Zach singing "Your Grace Still Amazes Me!" Great article on a great and talented kid. Keep it up Zach and God Bless! Zach is my precious nephew and he is as sweet as he is talented. He has always had an "old soul", just way beyond his years! He has been such a blessing to my family along with his cute little sister Alexa, who is also a great singer and is learning to play the guiter. I love you both. His YouTube videos are unreal!! This kid will be a big star one day!